Dipper was a demon tasked with guarding Castiel and Lucifer's prison cells in Needham Asylum. Dipper is walking the halls of Needham Asylum, watching over Castiel and Lucifer, and begins mocking Lucifer. Lucifer's attempts at bravado are stopped when he attempts to attack Dipper, and the warding on his cell is activated, prompting Dipper to reveal as he walks away that they have given the warding an extra "kick" just for him. As Dipper returns to the cells, he asks if Castiel is directing his insults to him, but is directed to Lucifer. Seeing Lucifer sitting in his cell, he once again begins mocking Lucifer and his little stick, only to be swiftly attacked, allowing for the warding to be broken, and for Lucifer to stab Dipper in the neck with his stick. 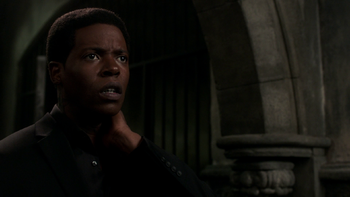 As he asks how Lucifer was able to do that, Castiel exits his cell and places his hand on Dipper's head, smiting him. This page was last edited on 3 March 2018, at 02:24.